Internet and Mobile Association of India (IAMAI) and IMRB have reported that there will be 45 million, or 4.5 crore internet users in rural India by December 2012. Dr. Subho Ray, President of IAMAI believes that internet penetration of 4.6% in rural India, up 73% as compared to 2011, is just the beginning of an unprecedented spike in rural internet usage in the near future. "This is just the tip of the iceberg, in the next two years, a combination of affordable smart phones, optic fibre backbone and local language content is likely to change the beat all projections of internet growth in rural areas", he said. From the IAMAI report, it also emerged that music, photos and videos turned out to be the major attraction for rural folk who accessed the internet. More than three quarters of rural internet access was driven by entertainment needs while slightly more than half of the users went online to communicate. 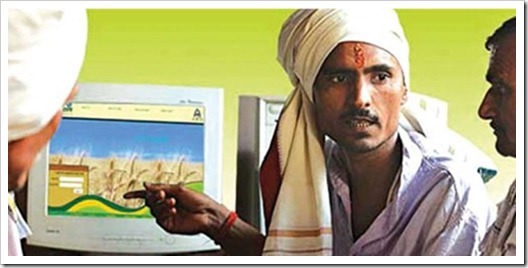 There were about 3 crore internet users in rural India in December 2011. The 50% spike leading to the expected 4.5 crore by December 2012 is primarily driven by mobile internet access, community centres and cyber cafes. Amongst the three, mobile internet was seen as a ‘fast emerging’ access point for the rural population. Mobile internet in India has triggered many pivotal changes in media consumption in India. A recent survey revealed that a certain section of urban users have cut their consumption of media and information from traditional sources like TV and newspapers by less than a half; only to access online content from their mobile devices. In % terms, internet penetration in India is believed to be one of the lowest in the world. It could be because of the fact that penetration of internet into rural India, which is estimated to be more than 60% of India’s billion plus population, is only 4.3% according to IAMAI. Lack of infrastructure and lower than average speeds have been considered by commentators, as the reasons behind these staggeringly low levels of penetration. However penetration levels could be on the verge of an unprecedented upward trend. Potentially, many favorable factors play into Dr. Ray’s comment that ‘This is just the tip of the iceberg’. State governments and companies alike, are infusing IT into various areas of rural infrastructure. ITC’s E-Choupal, Iffco Kisan Sanchar and Reuters Market Light (RML) are some of the mobile and IT based initiatives that Indian farmers are using regularly to access information regarding weather, crops, pricing, etc. S Srinivasan, CEO, Iffco Kisan Sanchar confirmed to ET that more than 12 lakh farmers listen to voice messages on their mobile phones to get monsoon related updates every day. It is also hard to ignore how smartphones have got cheaper and mobile internet access has become affordable. The mobile phone market is flooded with sub Rs. 10,000, cheap android based smartphones. As telecom operators pump in millions of new entrants every month into India’s mobile subscriber base, 35.2% of which is rural, internet consumption and penetration is undoubtedly expected to rise.